Congratulations to "Joan V" and "Shelley P.", the winners in Karen's giveaway. Thank you to all who participated! Unlike most authors who start to form a novel with ideas of character or plot, I always start with a setting which intrigues me. I’ve used Amish country, Appalachia, Denver and Seattle—all places I know and love. (And of course Tudor and Edwardian England for my historical novels.) But for my new rom/sus series which first hits the shelves in the wintry month of December (the second book is in February) I picked a place that says sun and sand for the launch of THE SOUTH SHORES SERIES. I’m certainly not the only author to put place first. I was thrilled to meet famous British mystery writer P.D. James years ago at a conference in Florida, and she told me she always begins with a place. “If the place is real, the characters and story will be too,” she said. My husband and I spent thirty winters as snowbirds in Southwest Florida—Naples, to be exact. We were a 15 minutes drive from fabulous beaches and 15 minutes from the amazingly wild Everglades. We love and know the area well. Despite the glitz and glamour of SW Florida, there is also an “old Florida” that totally intrigues me and which I take advantage of in the series, especially in the launch book, CHASING SHADOWS and book #2 DROWNING TIDES. Our son and daughter-in-law own two shops in Olde Town St. Augustine, and I also love that area. Besides that setting, in book #1, my hero and heroine go to a Civil-War era plantation called Shadowlawn along a cypress treed, Spanish moss festooned river. And it has ghosts. The thrust of each novel is the hero and heroine working together to solve crimes which could be murder, suicide or accidental death. Claire Britten is a forensic psychologist, fighting her own problems of a new divorce and the disease of narcolepsy. Nick Markwood is a criminal lawyer with a powerful enemy. He hires Claire to help with the plantation case when he sees how sharp she was testifying in the trial he just lost. She is good at “listening to the dead” as they speak through evidence and people they have left behind. Nick and Claire work together under threats and attacks, but can they really trust each other? A lush tropical setting can lure people to let down their guard, and Claire and Nick cannot afford to do that. I love choosing an ambience for a book which seems benign but has hidden dangers lurking. In a romantic suspense, such a deceptive setting can draw the hero and heroine closer together as they fight to protect their client—and fight for their lives. 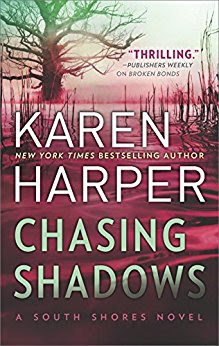 To warm someone’s winter nights with a setting and a story perfect for winter weather, I’m giving away two copies of CHASING SHADOWS. See the JRS rules for entering. Happy, scary and sunny reading! Giveaway ends 11:59pm EST Dec. 3rd. Please supply your email in the post. You may use spaces or full text for security. (ex. jsmith at gmail dot com) If you do not wish to supply your email, or have trouble posting, please email maureen@justromanticsuspense.com with a subject title of JRS GIVEAWAY to be entered in the current giveaway. Wow, narcolepsy! That's definitely something new and original. Looking forward to reading Claire and Nick's story. Ooh sounds interesting! Thanks for sharing! Different settings make the armchair travel loads of fun. I have really enjoyed your books in the past and look forward to reading this one. Thanks for the giveaway! I think I've missed the giveaway deadline (I'm a little fuzzy on that, but know they close fast) but I'm glad I stopped by and saw this post. I love the sound of your series! The heroine's skills and talents intrigue me, and I've been in love with St. Augustine ever since I and my family stumbled across it years ago. Always planned to go back, still haven't managed it. Sounds like your books will be the perfect vicarious trip!